The 52-year old seer and his three accomplices -- a woman, her husband and his friend -- have been charged with murder, attempt to murder and criminal conspiracy. 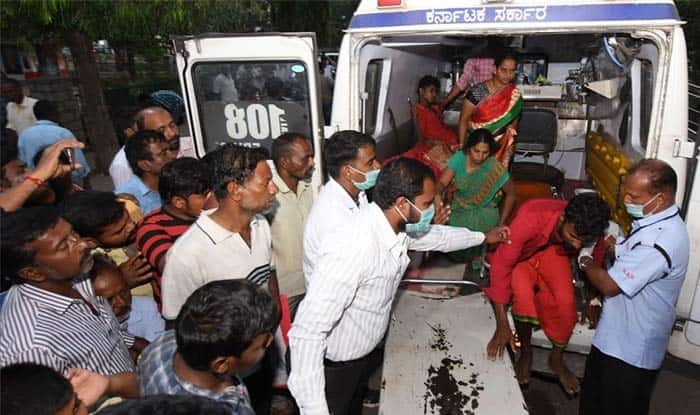 Bengaluru: Days after 15 people died of poisoning and over 120 hospitalised after eating prasad, or religious offering, at a temple in Karnataka, a local seer and three others were arrested on Wednesday on charges of conspiring to kill devotees to defame the management and take control of the shrine. Police say 15 bottles of pesticides were added to the prasad while it was being prepared. The 52-year old seer and his three accomplices — a woman, her husband and his friend — have been charged with murder, attempt to murder and criminal conspiracy, senior police officer KV Sharath Chandra said. “Mahadeshwara Hill Saluru Math seer Pattada Immadi Mahadeshwara Swamy or Devanna Buddhi connived not only to take over the temple trust but also to defame the existing trust members,” he told reporters in Chamarajanagar. The seer was in control of the temple trust till 2017, but was sidelined later, which infuriated him, the officer said. On orders of the seer, the 35-year old woman allegedly arranged for pesticide and her husband and his friend mixed it in the prasad while it was being prepared, he said. 15 died and more than 100 people are still in hospitals after consuming the poisonous prasad on December 14 at Sulvadi at an event to celebrate the groundbreaking ceremony for construction of the tower of the Kichchugutti Maramma Devi temple. He said the temple was under the total control of the seer till April 2017 generating huge money for him. However, at the insistence of local villagers and devotees, a trust was formed for expansion of the temple. “The seer was upset with the formation of the trust without his wish as his source of income almost dried up. Since then, shadow boxing between the temple management and the seer began,” he said. In October this year, the trust decided to build the ‘gopuram’ (tower) and revealed its plan to the seer, who readily volunteered and got an action plan for Rs. 1.5 crore from a temple architect in Tamil Nadu, he said. The seer allegedly planned to mint money but the trust discarded his plan, saying that it was a sheer wastage of money and prepared another for Rs. 75 lakh and decided to hold the groundbreaking ceremony on December 14, which irked him, the officer said. The seer directed the woman to mix poison in the prasad to defame the temple management and avenge his insult, the officer claimed. On December 14, the two men had poured 15 bottles of pesticide in the prasad after sending away the cooks, he said. The cooks returned and noticed a bad smell. They misled the cooks by saying that it was smell of edible camphor added to the prasad.